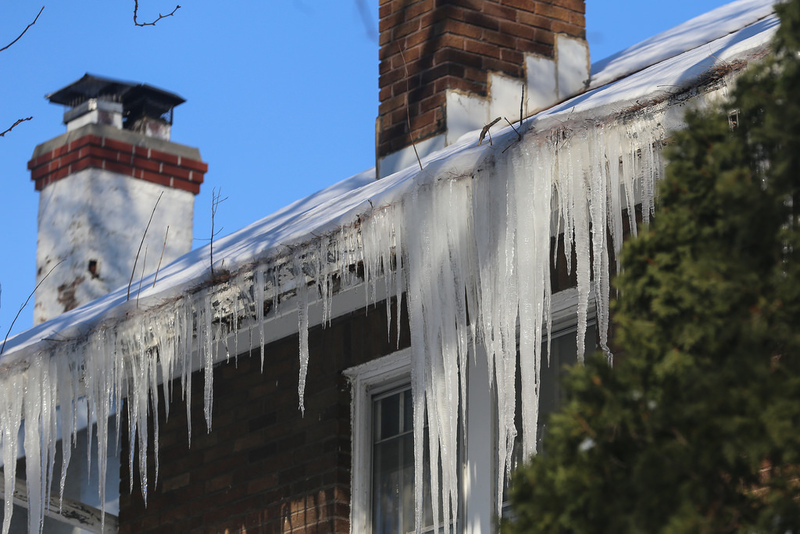 What Are Ice Dams and How Do You Avoid Them? Ice dams are a common winter phenomenon that causes damage to your home when the combination of warm air leaking from poor ventilation in your attic melts snow on your roof which then leaks and refreezes on your eaves. The ice dam can be even more dangerous if your gutter system is clogged. It is important to understand what ice dams are and learn how to prevent them because unchecked they can cause serious damage to your roof, gutters, interior drywall as well as paint and insulation on any exposed surface. Ice dams are formed when the exterior temperature is below 32 degrees and the roof temperature is above 32 degrees. The warm roof melts snow which then leaks toward the gutter system, forming ice on the colder eave. The ice then acts as a dam and blocks water trickling down from above forming pools. This water can cause all kinds of mischief including soaking the roof sheathing and your insulation, even soaking ceiling drywall and leaking into the house. The weight of the ice dam itself can cause a gutter system to collapse. The best way to prevent ice dams is to prevent the snow from melting and refreezing in the first place. Heat must be blocked from the attic and the lower roof must be kept at a temperature close to the exterior temperature. This can be resolved through a ventilation system that circulates cooler air from the eaves and the lower roof to the top of the roof, keeping the roof cool and less susceptible to melting snow. Although proper ventilation can help, if the attic collects too much heat, the problem will persist. Decrease attic heat by insulating can light fixtures where warm air can leak into the attic from the light bulbs. Improperly vented bathroom exhaust fans as well as poorly insulated duct-work can also cause warm air to rise into the attic, causing snow to melt on the roof. Another way to keep heat from rising to the attic is to install insulation on the attic floor. Additionally, finding and sealing leaks in the attic floor would help. It is harder for water and ice to dam up if the gutters and downspouts are clean. Get rid of the fall leaves before the cooler weather arrives and make sure your downspouts are in working order. The best time to prevent ice dams are in the warmer months; however, if you find yourself with an ice dam in the winter—or the potential for one—there are a few possible solutions. Safe options are few at this point, unfortunately. A roof rake looks like a 20-foot-long aluminum hoe. It is used to pull snow off the lower section of the roof onto the ground. Be careful to avoid large patches of falling snow that can damage shrubs or bushes. Remove the lower 4 feet of snow to help prevent the ice dam from forming. Don’t ever push snow off your roof while standing on top of it. Calcium Chloride is considered the best product to melt ice dams. It causes less corrosion and staining and operates at cooler temperatures, and because of this, can melt larger volumes of snow and ice. It can, however, damage wooden gutters. Ice dams can cause a great deal of damage, not only to your roof, but also your attic plumbing. However, with some preparation, ice dams are easily preventable. Stay safe and warm by troubleshooting this problem in the warm months to avoid roof work in the winter.